No, you're not misreading things: Nova Scotia Music Week's headline act this year was Toronto's Blue Rodeo. Bringing in an outside act as the marquee, weekend-ending attraction is something new for province's annual music industry celebration, but in many ways it's a logical extension of its mission. Like the festival itself, it brings a musical extravaganza to smaller locales across the province, and by pairing the show with the rest of NSMW in a rather affordable package, it hopefully gets more of the local community connected with music from their own backyard. 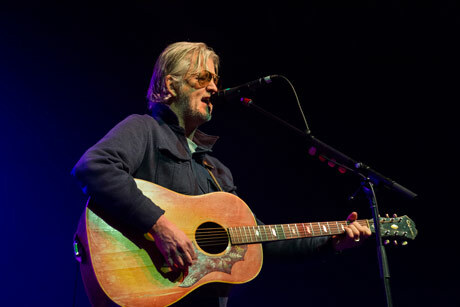 In that sense, Blue Rodeo was a good fit — not just because their style and sensibility are a good match with certain sectors of the province's music scene, but because two members of the band, including Greg Keelor, are Nova Scotia-born. "And the rest of us wish we were," added Jim Cuddy. I couldn't recall if I've ever seen Blue Rodeo live before, strangely: I feel like I must have, but they're also one of those groups that have been woven so deeply into the collective consciousness that their hits, and even some of their deep cuts, register almost by osmosis. You likely know many of them by heart and they're inarguable classics, through and through. Though the band didn't drop any seasonal favourites from their upcoming Christmas album, they did play four tracks from last year's In Our Nature, and songs like "Never Too Late" and "Mattawa" fit right in amongst the better-known material. Of the back catalogue, 1990's Casino was best served by the show, as the band played four songs from it; the bulk of the remainder was pulled from the band's '80s and '90s records. Opening act Adam Baldwin noted during his set that he listened to Blue Rodeo's albums growing up, playing along and trying to crack Greg Keelor's unique guitar style. ("I haven't figured it out yet," he laughed.) Sadly, the reality of Blue Rodeo in 2014 means Keelor is restricted to basic acoustic accompaniment due to his hearing issues. While his presence at all under the circumstances is welcome and essential, the absence of his playing doesn't go unnoticed. The trade-off the band offers is more soloing from players like guitarist Colin Cripps and keyboardist Mike Boguski, which at times grows a bit tiresome: a ten-minute take on "Diamond Mine" was thrilling, but by the time songs like "Disappear" and "You're Everywhere" descended into solo after solo, I found myself wishing the band were offering up more songs instead of so much more of each song. That said, the show still shone, largely because of the thrilling tension between Keelor and Cuddy's voices. It would be cliché to suggest that the divide in the band is between Keelor's rugged sensibilities and Cuddy's pop instincts — and there's enough of a balance of both in each to challenge such a simple dichotomy ¬— but, on a vocal level, it's a fair comment. Cuddy's got a soul singer's sense of tone and timing, whereas Keelor stumbles into his notes with a raw, raspy force. Separately, they each pull their songs ever so slightly in their own direction — my taste leans towards Keelor's — but together they create a whole spectrum of vocal timbre that remains as wonderful today as it did on Outskirts nearly 30 years ago. The two opening acts reflected, in some ways, the Cuddy/Keelor divide. Carleton Stone, who earlier in the day received the Nova Scotia Music Award for Recording of the Year for his 2014 album Draws Blood, echoes both Cuddy's professionalism and melodic tastes. Songs like "Love into the Light" and "Climbing Up the Walls" are catchy fusions of blues-rock with pop motifs, and Stone is an engaging, charming personality onstage. In contrast, Adam Baldwin is all raw, raspy rock and roll — mumbly when he speaks, intense and forceful when he sings. Baldwin, who moonlights as Matt Mays' guitarist, is a Springsteen fetishist, to put it politely. Not only are his songs strongly Boss-influenced, but he even wove lyrics from deep, deep Bruce cut "Held Up Without a Gun" into his own "Tarred and Feathered" (a reference only fellow Springsteen fetishists would ever pick up on). But there's no one in Nova Scotia who can touch what he's doing right now on his ballads: tracks like "Ballad of the Burning Man" and set-closing "Love You With My Eyes Closed" are small, beautiful little songs that build into massive, heart-stirring walls of glorious release. Given his taste for balladry, it was little surprise that Baldwin was called back to the stage at night's end to join Blue Rodeo for a show-closing take on "Lost Together." Baldwin would later tweet that the song "saved his life as a young man," and if there's ever a Blue Rodeo song that could do such a thing, it's that one. Some of the band's standards have lost power over the years through their omnipresence ("Try," for example), but not "Lost Together." It remains something special: a hymn, a prayer, a love song, a transcendent little moment that echoes through the years, gaining weight and heft but never losing what made it special in the first place. Jim Cuddy Band Chart Cross-Canada "Constellation Tour"